I’ve never been a huge fan of football. It always seemed unnecessarily violent, even barbaric, to me. After a 2017 article in the New York Times revealed that 111 former NFL player’s brains were donated to science after their deaths, and 110 of them were found to have C.T.E., the “degenerative disease linked to repeated blows to the head,” I decided the NFL was disgusting. Keep in mind, this without me even mentioning the sexist and unfair treatment and pay of NFL cheerleaders who make $7.25 an hour, but I digress. However, if there is one shining light in the world of football, it would be the actions of one brave player, Colin Kaepernick. I may not like barbaric violence used for entertainment, but I do admire people who are brave enough to use their influence to take a stand against systemic oppression, police brutality, and injustice. In case you have been living under a rock and have no idea who Colin Kaepernick is, he was the quarterback for the 49ers when he decided to peacefully protest by taking a knee during the national anthem during the 2016 season. This move turned out to be quite controversial, as some viewed it as disrespectful and some (like the National Educators Association), saw it as a man taking a stand against injustice. 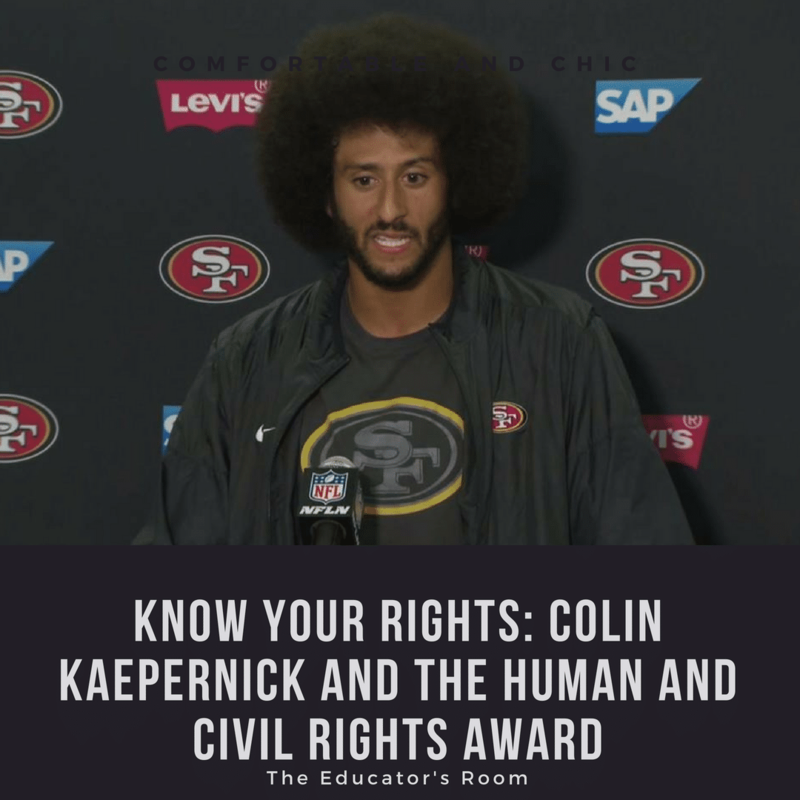 According to their website, for over fifty years the NEA has “recognized and honored educators, individuals, community partners, and organizations that are advancing the mantle for human and civil rights.” This year, they gave Colin Kaepernick the prestigious Human and Civil Rights Award for his founding of his “Know Your Rights Camp”, which he has fully funded since its creation in 2016. Since Kaepernick has decided to take a knee in 2016, he has been systematically banned from the NFL, with no team daring to pick him up. He has gained national attention, he’s even ruffled President Trump’s feathers, and is now being used as an “example” by the NFL, of how they will not tolerate any social justice activism on their field. Despite all of the negative attention and blows to his football career, Colin Kaepernick remains unwavering in his stance. Because of this, he is an outstanding example of having courage and bravery in the face of adversity. He is the perfect role-model, showing students the true meaning of resilience; staying strong in your beliefs, even when it seems like a lot of people are against you. He’s never wavered from his original stance, and he’s even put his money and efforts behind his actions by starting his own organization to help the youth in America. If part of the mission of the NEA is to,“prepare every student to succeed in a diverse and interdependent world,” then I would say Kaepernick is one who fulfills this mission through his know your rights organization. He understands the importance of educating our youth so they may also stand up for justice, even when times get tough. You already know how I feel about the NFL, and their treatment of Kaepernick just solidifies my view on how disgusting this organization truly is. But, on the bright side, Kaepernick has drawn attention to serious issues in our country, has been recognized by organizations like the NEA, and has helped youth through his “Know Your Rights” campaign, so I would say he’s the real winner. I have faith that history will show this.